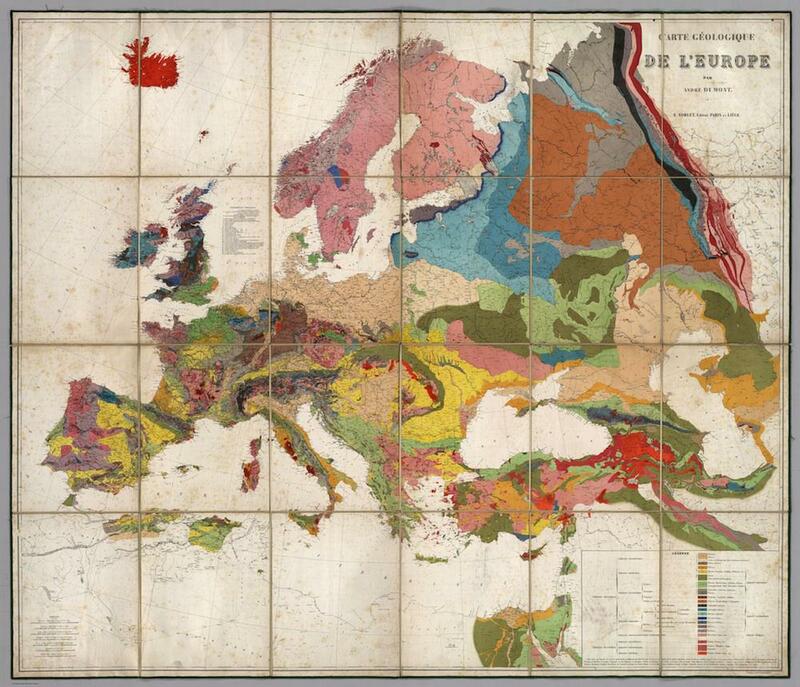 History of geological maps: Andre Dumont's map of Europe. This stunning geological map of Europe was produced in 1875 by Andre Dumont, a Belgian scientist and mapmaker. Dumont, who previously published a geological map of Belgium that took him 20 years to complete, was one of the first cartographers to successfully deploy the techniques of chromolithographic printing to represent geology in vibrant color. The map, which folds up into a case, is composed of 24 sections. Geologist David Bressan writes that the color scheme used in many geological maps derives from the work of Johann Wolfgang von Goethe, the writer who was also a mining inspector and color theorist. Goethe helped design the color scheme for a geological atlas of Germany that was published in 1821. Bressan argues that some aspects of Goethe’s color-coding—“red for igneous rocks, blue for limestone”—took hold as common conventions used by future mapmakers. Indeed, Dumont’s reds are igneous, and he assigned blue to the landscapes shaped during the Devonian period, which (like the Basque Mountains of the Iberian Peninsula) often feature limestone. “Carte Geologique De L’Europe,” Andre Dumont, 1875.